A town which has experienced 30 earthquakes in 50 days is currently the "most seismically active" area in the British Isles, seismologists have said. The recent tremors in and around New Ollerton, Nottinghamshire, have been attributed to mining. The British Geological Survey (BGS) said the "swarm" of tremors were not likely to cause damage and could soon reduce again. The earthquakes have all been small, with the largest magnitude being 1.7. The BGS said it had recorded 41 earthquakes around the British Isles over the last 50 days with the majority happening in Nottinghamshire. The most recent was recorded at 02:06 GMT and had a magnitude of 1.3. BGS seismologist Glenn Ford said many people would not have realised the tremors were earthquakes and would have disregarded them. "People often think it's traffic noise or a train," he said. Mr Ford said the last significant earthquake in the British Isles was in Market Rasen, Lincolnshire, on 27 February 2008. The 5.2 magnitude quake was over 30,000 times larger than the ones in and around New Ollerton and was felt across England and Wales. 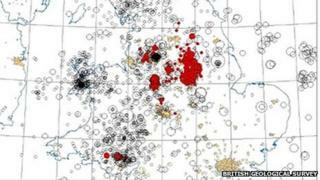 The affected area of Nottinghamshire has a history of seismic activity related to coal mining. UK Coal said the recent earthquakes could have been caused by mining at Thoresby Colliery, but people should not be concerned.